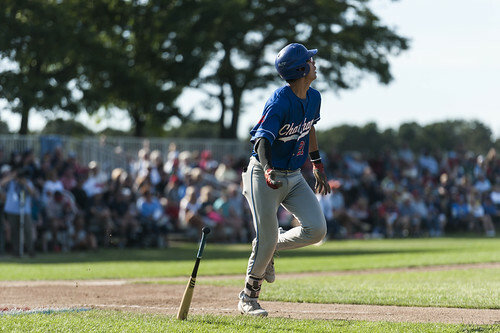 The Chatham Anglers (12-11-2) are back above .500 after sweeping Tuesday’s doubleheader at the Falmouth Commodores. 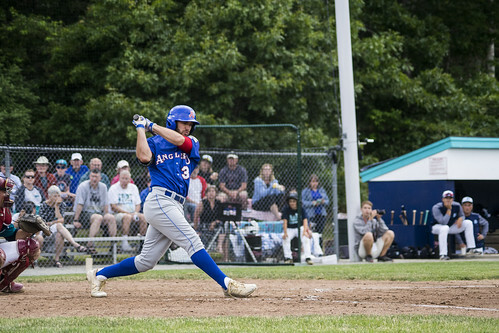 Wednesday marks a more prominent challenge for the A’s as they take on the Wareham Gatemen (15-11) at Veterans Field at 7 p.m.
To extend their win streak to three, the Anglers will have to pick up their first win over the Gatemen this summer. Chatham is 0-3 against the leaders of the Western Division on the season with a run differential of -15. Chatham rebounded from its consecutive shutout losses on July 4 and 5 with a 9-6 win over the Harwich Mariners, but again showed its inconsistencies in the next two games with 10-1 and 9-3 losses to Y-D and Orleans. The Anglers’ 1-0 win in the front end of Tuesday’s doubleheader at Falmouth is the first time since 2015 that the A’s won a ballgame by only scoring one run. Ten different Chatham players recorded a hit in Tuesday’s doubleheader. In game two, the A’s nine hits came from seven different players. Chatham’s stretches of low scoring have caused it to drop in the league ranks of offensive categories. The A’s were overtaken by Orleans for the league’s lead in home runs after the Firebirds smashed four long balls at Veterans Field on July 9. The Anglers’ 109 total runs and .238 team batting average each rank fourth-to-last in the league. Strikeouts have been crucial to the success of A’s pitching this summer. The team has spent most of the season leading the league in K’s and strikeouts per nine innings. However, over the last five games, the team has struck out only 31 batters — the fewest in the league over that span. Chatham has still won three of those five games. Part of the reason for the lowered strikeouts is that the A’s played two seven-inning doubleheaders during this time frame. Another reason is the pitchers who have seen action over the last five games. Jack Conlon (San Jacinto), Hunter Gaddis (Georgia State) and Kyle Hurt (Southern California) — three of the five pitchers on the team with the lowest K/9 numbers — made starts during this time frame. Plus, two of Chatham’s best strikeout pitchers, Jeff Belge (St. John’s) and Alek Manoah (West Virginia), did not have their best stuff during their respective outings. Chatham will start to throw more strikeouts soon, but this stretch of play shows they do not have be blowing the ball past every batter in order to win a game. Blake Sabol ranks tied for second in the league with four home runs. Blake Sabol (Southern California) has been the engine of Chatham’s offense in the past week. The utility man has hit as high as second in the lineup and as low as eighth. Sabol has also played each outfield position in the A’s last five games. The California native has been on a hitting tear. Sabol got on base five times in game two of Tuesday’s seven-inning doubleheader at Falmouth, including two singles and a three-run home run. He has 12 hits in his last 11 games, boosting his batting average from .217 to .320 over the two-week span. But Sabol’s contributions don’t stop there. The rising junior has walked four times, stolen two bases and scored three runs in the A’s last three games. Six of Chatham’s 11 runs in its last three games have come from Sabol driving in or scoring a run. Despite Chatham’s inconsistent offense, it has done one thing regularly — get its leadoff hitter on base. In its last three games, the A’s have started 12 of 23 innings by getting on base. In game one of Tuesday’s doubleheader, Chatham started three innings with a leadoff double. Half of the 12 instances, however, have come from a walk or hit-by-pitch. John Rave (Illinois State) has been the biggest contributor to this trend. The lefty is 3-for-5 in the A’s last three games when he leads off an inning. His first-inning double in game one of Tuesday’s doubleheader led to the only run of the game in a 1-0 Chatham win. Over a three-game stretch from July 7 to 9, the Chatham pitching staff dealt with command problems. During that three-game stretch, 131 opposing batters came to the plate and 27 reached base without having to swing a bat, as nine pitchers combined to walk 18 batters and plunk another nine. In those three games, about one out of every five opposing hitters was walked or hit-by-a-pitch. John Rave is the only Chatham player to record a double, triple and home run on the season. Until Tuesday, there had been a common theme in all of Chatham’s victories — scoring lots of runs. In all of its first ten wins, the Anglers had scored at least four runs. In each of their losses, the A’s had scored four runs or less each time. By defeating Falmouth 1-0 in game one of Tuesday’s doubleheader, Chatham picked up its first victory by scoring less than three runs. Chatham has back-to-back home games over the next two days. First, the Wareham Gatemen travel across the Cape Cod Canal to visit Veterans Field for a Wednesday night matchup. Then, the Bourne Braves make a visit to Chatham on Thursday. Broadcast coverage of the Anglers and Gatemen on Wednesday begins at 6:40 p.m. with the Anglers Extra Pregame Show. Listen to Cooper Boardman and Josh Schaefer on TRZ Teamline or listen by phone at 1-800-846-4700, code 3841. For more information, visit Broadcast Central.